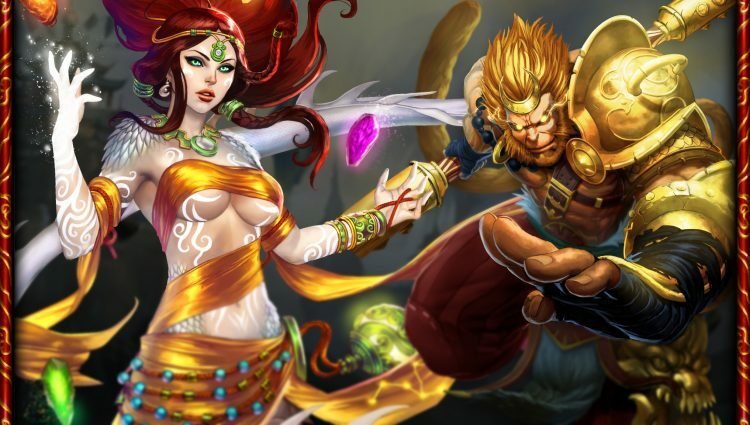 The Chinese Pantheon is now playable in SMITE Tactics. Every user will receive all of the Free Cards from the Chinese Pantheon. In celebration of the Chinese Pantheon coming to SMITE Tactics, we have also added a brand new Chinese Campaign! Completing the entire Campaign will reward you with 300 Favor and the Imperial Archer Rare Card. Win two games while playing as the Chinese Pantheon. Units with Colossal trigger their buff at the start of their turn. Units with Command trigger their Passive whenever a Friendly Item Card is played. Disarmed units are unable to Attack. LEADER, 1/18, Ranged, Ability: Spend 2 Mana to Stealth Friendlies in Target Area. Rare, 3 Mana, 2/3, Ranged, Command: Deal 1 Damage to a Random Enemy. Common, 3 Mana, 3/3, Command: Gain +1/+0 and Pardon until the end of your turn. Free, 4 Mana, 3/3, Ranged, Colossal: Gain +1 Range. Rare, 1 Mana, Give a Friendly Immune: Items and Abilities. Free, 0 Mana, Deal 1 Damage to a Non-Leader Enemy. Common, 3 Mana, Draw a Card for every Friendly on the Board. Free, 4 Mana, Spawn a random Friendly with Colossal. Common, 3 Mana, Select a Friendly God or Minion and deal its Attack as direct Damage to a Non-Leader Enemy. Common, 1 Mana, Deal 1 Damage. This item gains +1 Damage for every Friendly with Colossal in Play. Rare, 3 Mana, Deal 1 Damage to all Enemies. Common, 2 Mana, Set target Non-Leader’s Attack equal to its Health. The Illusion’s Health is based off of Ao Kuang’s Health when the ability is used. If the Illusion is not destroyed, it will explode dealing 1 Damage to all adjacent Enemies. Epic, 5 Mana, 4/5, Colossal: +1/+0, Ability: Teleport to a tile while leaving behind an Illusion with Taunt. Free, 3 Mana, 0/5, Ability: Heal Adjacent Friendlies for 2 Health and deal 2 Damage to Enemies if Hou Yi is in play. Epic, 4 Mana, 3/3, Ranged, Ability: Deal 2 Damage to an Enemy and a random Enemy adjacent to the Target. If Chang’e is in play, hit an additional Target. Legendary, 6 Mana, 6/7, Ability: Select an animal form. Eagle Form: Trigger all Friendlies Colossal and double your Movement. Ox Form: Deal 2 Damage to adjacent Enemies. Attacks now Knockback units 2 tiles. Tiger Form: Gain +2 Attack. Can Attack immediately. Common, 1 Mana, Disarm an Enemy until the start of your next turn. This patch, we have officially added a Ranked Queue. Players will start off by playing 10 Qualifying Games. After the player has completed 10 Qualifying matches, they will be placed into one of six Divisions. These Divisions are grouped by Bronze, Silver, Gold, Platinum, Diamond, and Masters. Tutorials have been revamped in CB3 to be story driven, and teach Tactics in a more fun and enjoyable way! Ceremonial Urns have been placed around the Egyptian Map and contain three Cards; Mana Potion, Urn of Health, and Urn of Attack. Destroying an Urn will give the player one of these three Cards. Urns can not be damaged by Item Cards. Mana Potion: Gain +1 Mana for this turn. Urn of Health: Give a Friendly +2 Health. Urn of Attack: Give a Non-Leader Friendly +1 Attack. We have added back multiple Anti-Aliasing options. These can be found inside the settings menu. An audio cue now plays when there is 15 seconds remaining on your turn. This patch we have made further adjustments to the UI which includes our brand new Health Bars and Action Indicators! Action Indicators allow the user to quickly scan the board to see what units still have actions left. Each Map in SMITE Tactics now has its own unique soundtrack. Is now triggered when a God is used to heal a God already in play. Mana cost reduced from 4 to 3. Attack increased from 2 to 3. Movement increased from 2 to 3. Movement reduced from 3 to 2. Can now use his ability on himself. Mana cost reduced from 2 to 1. Isis ability is no longer able to remove auras. Fixed an interaction with Sanctuary and Poseidon’s ability. Fixed various issues with buffs and Phantom Grasp. Fixed an issue where Cards could be drawn from the wrong location on the screen. Fixed an issue with challenge matches where decks could be preselected. Fixed an issue with the Leader XP progress bar not displaying correctly. Fixed an issue when drawing Cards near maximum hand size. Fixed an issue where pressing tab multiple times in the menu could break the menu. Isis ability description now correctly states that it can target leaders. Fixed an issue where Cards that draw other Cards were not being disCarded until after the Cards were drawn.